Sometimes it takes great courage to ask a question, especially if you are not sure that you can fulfill the answer. Mary Jane Hershey of Salford Mennonite Church had the courage to ask Katie Gard of the Oxford Circle Christian Community Development Association (OCCCDA) what they needed and Katie had the courage to answer, neither of them knowing what, if anything, might come of it. Salford Mennonite Church and Advent Lutheran Church share a garden on Salford’s property that, “exists to nurture relationships with one another and with God, cultivating a piece of God’s creation, and growing good food for those who need it most.” The produce from the garden is donated to individuals in need throughout the community, including to various non-profits. 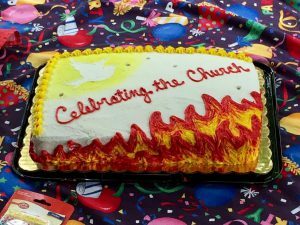 Oxford Circle Christian Community Development Association (OCCCDA) of Philadelphia is one of those non-profits. At the annual fundraising dinner held at Salford to garner funds for seeds and supplies, Mary Jane Hershey encountered Katie Gard and asked that courageous question: what do you at OCCCDA need? She didn’t know what the response would be, or what it would cost her and her community. She didn’t know if she’d be able to fulfill whatever the answer was. Yet she stepped out and asked. Katie took a risk, too, as she answered, asking for a visit to the Salford garden for their summer camp. The camp receives produce from the garden and Katie believed the kids would benefit from seeing where the produce comes from, and from being in the country. Katie didn’t know how it might happen. She didn’t know what it might require from Salford or Oxford Circle, but she gave her answer. Mikaylah Price, Adele Shoup, Aubrey Andrews, and Ila Hackman (left to right) show off the carrots they harvested in the Salford Advent community garden. That was not the end of the small acts of courage. Through collaboration and coordination, plans came together. 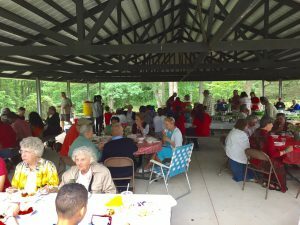 When the buses pulled up on July 13, several Salford kids and parents were waiting hesitantly as 72 kids and 18 adults from the summer camp got organized. The summer camp kids didn’t quite know what to expect either, but their capable staff lined them up and we split up into our stations. 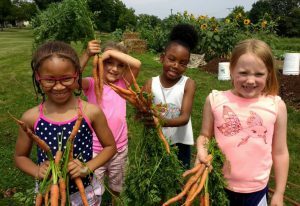 Between the garden tour, harvesting carrots, introducing the Oxford Circle campers to Gaga ball, and playing water games, kids from Salford and Northeast Philadelphia started to feel at home together. Teammates cheered each other on and helped each other out. Campers harvested carrots to take home. The next week, when the produce from the garden came to OCCCDA, they knew where it was from! Asking questions and offering answers both take risk — the vulnerability of submitting one’s idea to the direction of another. After that first risky question and answer, the questions and answers kept happening: How do we make sure the food we serve is halal? Is it ok to shorten this activity? What games do you like to play at your house? No, they shouldn’t have a second popsicle. Do you want to play with us? The summer camp kids and adults were taking a risk, asking a question, just by getting on the buses and coming to this predominantly white country church to enjoy our space. 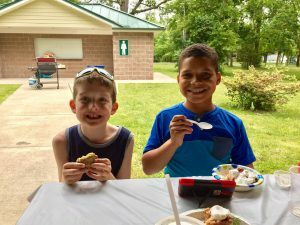 Salford families and volunteers needed to respond by accepting the schedule and needs of the well-functioning system that is Oxford Circle Summer Camp. I saw our Salford kids offering welcome in the garden, a familiar space to them, to kids who were seeing it for the first time. I saw them experiencing being welcomed and invited into the games by strangers, needing to depend on the welcome of the summer camp kids. Questions were asked, answers were given, God moved, and the results were abundantly far more than we could have asked or imagined. Photo: Mikaylah Price, Adele Shoup, Aubrey Andrews, and Ila Hackman (left to right) show off the carrots they harvested in the Salford Advent community garden.